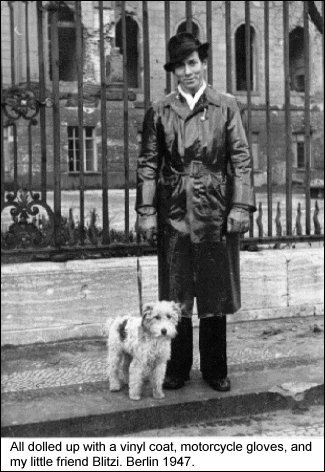 By June 1948, we Berliners had experienced a definite improvement in our living standard. Electricity was now available 24 hours a day. Food rationing slowly disappeared. Coal became available. And if it had not been for the rapid price increases, all would have been peachy. Apparently the Russians had been busy for years printing military money, the same money I had received while in the British POW camp. It slowly created an intolerable situation, causing inflation. The Western Powers decided to create a West Mark called Deutsche Mark. At the same time the Russians issued a new German Mark, which became the East Mark. The Western government introduced the new Deutsche Mark by exchanging all the old money, the Reichsmark, to the new money. Every adult living in West Berlin and West Germany could exchange up to a certain sum at a 1/1 exchange rate. I can not remember the amount allowed, but I believe it was 500 marks. The exchange of old money would be at a rate of ten old marks to one new mark for any amount larger than 500 marks. Our family had more than 500 marks each and hated to get only 10% of the amount that exceeded 500. I was not a paymaster in the army for the fun of it. I had to come up with some angle. After inquiring among my friends and relatives, I noted that some of them did not even have 500 marks to exchange. I suggested that I could exchange the amount of money they had at a 1/1 rate and give them 20 marks extra, provided I could use their I.D. card. I found many takers, enough to get all of our old money exchanged at the 1/1 rate. Apparently, word spread quickly that I could handle money exchanges. Two weeks later, some friends of my cousin Rudy approached me with a deal. They, husband and wife, had relatives in the USA and the two had received American dollars in the mail. They wanted them exchanged to East German Marks, since they lived in the Eastern Zone. They had 400 dollars. I let them know that any money exchange would be a risk. The reason for the risk had to do with the kind of people one had to deal with. If it were not for the charlatans, life would have been easier. I laid it out straight, "I’ll try to change your money first to West Marks and then to East Marks. Should anything happen, you will be the loser. I promise to take every precaution, not to lose your money." I asked my cousin Rudy to be my bodyguard during any risky exchanges. Cousin Rudy agreed. Getting information on exchange rates would be the first step. The black market for exchanges between dollars and West Marks was near the Kurfürsten Damm, a main boulevard in the center of Berlin. I found out that the exchange rate was between 4.5 to 5.5 West Marks for one dollar, according to the various moneychangers. I made a date with a fellow who offered a rate of 5.8. That rate was high, and any meeting with this sort of fellow required a bodyguard. Rudy was a few years my senior, and 6 feet tall, weighing 200 lbs. At the appointed street and time, I met the stranger and we stood in a housing entrance cove. Since he knew I had 400 dollars, at the rate of 5.8 he would have to give me 2,320 Deutsche West Marks. My four hundred were in $20 denominations, and he counted them. I took the dollars back from him, until I counted his money. I counted it, and I counted 2,220 marks, 100 marks short. Being 100 short, he grabbed his bundle back and took 100 marks, and added it to the bundle, plainly to see, so it appeared. He then proceeded to push that bundle of money into my pocket, and acted as if he had done his part. I quickly took the bundle out of my pocket, and tried to count again. He stopped me right there. He grabbed his bundle, mumbling something like, "I guess you don’t trust me." With that, he turned around and left. I signaled Rudy the OK. I am glad I had Rudy with me. They had planned to rip me off. That bundle he handed me the second time was most likely all blank paper with a few notes wrapped around it. If I had been smarter, I would have accepted the first count, and still would have had a good deal. However, I do not think he would have gone through with that, and most likely would have gotten his money back somehow. I will never know what he would have done. Since we were still in the neighborhood, I heard of a jewelry store, one block away, which changed West Marks for dollars. When I entered the store, two Arabic-looking fellows asked if they could do something for me. I said, "I hear you might be exchanging dollars?" Oh no, was the first answer. When I acted disappointed, they responded, after a slight hesitation, "Could we see maybe one of your notes?" Sure I said. They looked at it, smelled it, touched it, held it up against the light, and then asked, "If we were to change money, how much are we talking about?" I told them I had 400 dollars. Again some hesitation, then they took a chance. They probably thought that I was too young to be a policeman. "We can give you 4.5 West Marks for one dollar." Now I acted disappointed. I chuckled and said, "I can get that anywhere." After more acting by both parties, they came up to a 5.1 rate. I thought, if I am firm, I will get 5.5. I told them that I was thinking of a rate closer to 6.0. They chuckled. They repeated the 5.1 rate. Now I acted some more. I turned around, shrugging my shoulders and opened the door to the street. They called out, "Let’s talk about it." Fine, talk. The bid finally was 5.5 and I agreed. They counted the 2,200 Deutsche West Marks onto the counter, I counted the 400 dollars on the counter. The next stop, to change the West Marks into East Marks, was a place near the Brandenburg Gate. I knew that the going rate was 1 West Mark for 4.2 East Marks. The only difficulty was the large amount to be changed. Rudy, my bodyguard, was still with me. I handed him 2,000 West Marks to hold while I checked the market to find someone who could handle the large amount. He was not to be near me, nor should he let on that he even knew me. Just a safeguard. I acted now as if I needed to change 200 West Marks for East Marks at a 4.2 rate. A dark-skinned fellow caught my eye. I hoped that he was not the police. I had no problem with him and I changed the 200 West Marks to 840 East Marks. Then I asked him if he could handle a larger sum. "How large?" he asked "1,900 West Marks." "Give me an hour," he said, and when I agreed, he disappeared. An hour later, I had the 1,900 West Marks exchanged for 7,980 East Marks. I took 100 West Marks as my commission and shared it with Rudy. Rudy’s friends were delighted with their fortune and I had gotten a little excitement again. On June 24, 1948, the Russians isolated Berlin by restricting all barge traffic and all Autobahn traffic coming from the west. They also suspended all coal shipments from the Eastern Zone to Berlin. Then the authorities announced that we in Berlin would receive only two hours of electricity. They even threatened to stop the water supply. Just when we thought all was well, we had another crisis. I had started college. Now I would not even have a warm place to study, nor would I have light. What a mess. At first, we Berliners were worried about the Western Allies. Would they buckle under to the Russians who wanted all of Berlin? Luckily, they resisted and started an airlift, flying in certain corridors between West Germany and West Berlin. Tempelhof, Berlin’s major airport could not handle all of the planes. Refurbishment of two minor airports began immediately with the extension of the runways. It was unbelievable how the West got together to show the Russians what the West could do. Around the clock, many kind of airplanes landed in Berlin with supplies. Naturally, we went back on rations. We knew that we would again have to supplement our food supply. The planes supplied Berlin with dehydrated vegetables, white flour, and other dry goods. What we needed were potatoes, cabbage, turnips and other fresh food. By winter, we also would need coal or wood. Our one good fortune was that we still had access to the Russian Zone and East Berlin. It was restricted access, but access. The police would control the various transportation modes to discourage West Berliners from acquiring food or coal from the east. I had to do the same things I had done two years ago. I had thought that those days were behind me. Of the many trips to obtain food supplies, only two trips came to mind and might be worth mentioning. My cousin Rudy and I became not only partners providing for our families, but also became good friends. We worked well together and soon we collaborated to gather needed supplies. One morning, we got on a train and traveled to the Russian zone to get potatoes. We both had a little metal handcart with us, like a small flatbed cart. At a small town, we left the train and walked about a mile to a farmhouse. The farmer was very friendly. When we asked if he could sell us some potatoes, he answered that he could. As much as you can carry he said, and it will cost you only 20 marks for 100 pounds. What a deal. We got greedy. The farmer furnished the sacks and we filled eight of them with potatoes, about 800 pounds. The farmer only shook his head and grinned. We paid him with the greatest thanks we could muster. He said what he really felt about the Russian blockade and that we all must do our share to help the Berliners. He could have gotten into trouble with remarks like that. Now we had the job of getting that load home. The problem was not only the amount we had to move, but also we had to avoid the East police at the train station. Once we were on the train, we would be safe. Moving the eight potato sacks was tedious. The road to the station was dirt, not easily manipulated with the little handcarts. Therefore, we moved the sacks one on each cart. At the station, we noticed a large bush near the tracks. We stowed the two sacks in the bush. Then we repeated this procedure three more times. We could now wait for the train. We bought our tickets and hung around near the station. When the train was near, we left the station platform, walked to our bush and stacked our sacks in a pyramid fashion. This allowed us to place ourselves right and left of the sacks to heave them into the train from the far side of the platform. As soon as the train stopped, we opened a door, and we swung the eight sacks, all on top of each other into the compartment. Luckily, only one person occupied this compartment. We climbed on top of the sacks, closed the door and the train was on its way. After rearranging the sacks, we even had room to sit down. At the last station, we had to transfer to the S-train, our elevated train. We moved the sacks on the platform two at a time on our cart, always keeping the other sacks in sight. Stairs had to be taken one at a time. I could not lift a 100-pound sack of potatoes, instead we both grabbed them and carried them up and down the stairs. It was quite an operation. It took us one hour to move them to the S-Bahn. At our home station, we moved the eight sacks to the street, and then separated. Rudy went left and I went right. I loaded two sacks on the cart and moved it about 100 yards. I placed them on the sidewalk and went back to pick up the other two. It took a while and it was getting dark. When I arrived home, I called my father down for help. Mother was delighted with the potatoes. The second noteworthy trip that I took was also in the company of Rudy. Our uncle in East Berlin said he would give each of us 50 pounds of coal if we promised we would not tell anyone who gave us the coal. We got the coal from my uncle and promised that we would not reveal the source. I have to set the stage for what happened next. A while before this trip, Rudy and I saw a cartoon in the paper that struck us to be very funny. Two burglars had just broken the show window of a store and a policeman was standing behind them. One burglar said to the other, "Please turn around very inconspicuously." Three stations before the border, I told Rudy that when the train stops, I will hang both of our sacks of coal on the outside of the door. The train stopped and I opened the door. Using the S hook, I hung one sack on one door handle and was in the process of hanging the other one, when I heard Rudy say, "Please turn around very inconspicuously." I tried to be very nonchalant in closing the door and turned around. Sure enough, two East German policemen were standing right next to us. "Is something going on out there?" one asked. "Not very much," I answered. It did not help. At the next station, they made us bring in the sacks. But I noticed that one of the policemen had a real Berliner dialect to his speech. In my best Berliner accent, I praised the efforts of the East German police. I kept on talking and told them about our need for the coal. Anyway, at the next station they left and wished us wiedersehen or 'see you again.' It was a great surprise. It showed that control by the Communists over the population was not as strong as the bond of the people. In May 1949, the Russians finally ended the blockade of Berlin, realizing that the Western Powers would not abandon this city. It was high time that our living standard improved and the general atmosphere returned nearer to normal. The Marshall Plan had been in effect for two years already, but only West Germany benefited from it. My college performances during my first year were dismal. I ended up failing my first college semester and had to repeat it. I guess the Russian blockade and the resulting ventures were limiting my study and attendance time. By now, daily activities did not include so much time spent standing in line for food. Having to accept shortages of many items was now part of our past. Electricity, gas, and coal were available and the only disruptions in my studies were the ladies. I had more time to go dancing. Either my friend Werner or my cousin Rudy would accompany me to the various ballrooms. I did not know that one could have so much fun on a dance floor. I encountered many nice girls who danced delightfully and were able to follow every one of my crazy dance steps. Enjoying the company of many older ladies helped me to mature. I was a very late bloomer, barely shaved at 21, and I had maybe two hairs growing on my chest. After my first year of college, I had to choose my major, either mechanical and electrical engineering. I decided to become a mechanical engineer. The studying progressed much better now and my grades improved. I did not have to worry about history and Latin study. One of my professors even said, "Do not try to remember everything, just remember where you can find the answer." I preferred his procedure, and to his credit, all of his exams were open book tests. For over a year, nothing really exciting occurred until I dabbled in making fireworks. I had met two young ladies who worked in a pharmacy. I decided I wanted to make fireworks, not only rockets. The rockets were supposed to take the payload to great heights and end in colorful bursts. I needed a great number of chemicals and the two pharmacist's helpers obliged. First, I made a large bowl of black powder on our dining room table. That definitely was very smart. Then I stuffed the black powder into paper tubes I had rolled myself, packing the powder tightly. Very smart again. I added a fuse and taped a stick to it. Then I tested it in the flowerbed of our balcony. I stuck my homemade rocket into the soil, lit the fuse and stepped back. As soon as the burning fuse touched the tube, with a gigantic bang, the rocket disintegrated. It never moved even an inch upward. I was glad it did not break our windows. Meanwhile, I turned various chemicals into little balls, the size of marbles. They were supposed to give the colorful bursts. They needed drying. I laid them on a cookie sheet and placed the sheet into our tile oven's warming cavity. Very smart again, bordering on genius. It was evening and the oven was only slightly warm. I forgot to remove them from the oven, however, and the next morning my mother placed firewood in the oven and started a fire. Within a few minutes, I heard a strange hissing sound. When I looked over to the oven, I saw smoke pouring out. My little color balls burned. The room had a very high ceiling, about 12 feet. The colorful smoke occupied the entire room down to about 4 feet from the floor. I have to admit, my mother was not pleased, saying it lightly. This was the end of my rocket experiment. I could not resist, however, to save the black powder for New Year's Eve. I placed the bowl of black powder on top of the remnants of a blown-up concrete bunker, left over from the war, and lit it. It burned very nicely for at least a minute. Still and all, I could never hope to be a rocket scientist. Had I been clairvoyant, I would have known that 14 years later I helped send many spy satellites into polar orbit without blowing up the booster. In early 1950, my sister and her two girls moved to Cologne, West Germany. My brother-in-law had found a permanent place to live, financially supported by the German post office. This forced us, my mother, my father and I to look for a new apartment. My parents liked the outlying apartment complexes. It was a very peaceful area and the buildings were only two stories high. I had my own room. I commuted to college by bicycle, in rain, snow or shine. Many major streets of Berlin had bicycle lanes. The lanes were elevated to be even with the sidewalk and created a buffer zone between the sidewalk and the street. The last semester towards my engineering degree was in progress. My father was still working for the forest service. My mother did not go back to her market business and enjoyed her retirement. Weekends were time for visitors. Three of her sisters and friends came to visit often and my mother invariably had cakes and coffee ready. My time was divided between schooling and the ladies. When I came home late from a dancing establishment, it was easy to miss the last streetcar. A few times, I walked miles, before finding another line, which took me closer to home. One day Hilde, a young woman I had met, asked me as a favor to pick up a zinc washtub from a friend of a friend. The friend informed Hilde about a small hole in the tub. I had seen my father repair little holes in zinc tubs and said I could fix it. Hilde handed me five marks for the asking price. One quandary; the tub was located in East Berlin and visiting that section of Berlin was not my favorite activity anymore. A short ride on the elevated train and a short walk, not too far from the border, brought me to the washtub lady. The border was still relatively open, except they checked luggage sometimes to prevent smuggling. I gave the washtub lady the five marks and she handed me the tub, pointing out the little hole. The tub weighed about 20 pounds. It was oval shaped, about 4 by 3 feet. I took the tub under one arm and was on my way back to the train station. The station was right on the border between East and West Berlin. About 30 yards from the border, two guys in civilian clothes blocked my way. They identified themselves as detectives, East German police. They wanted to know the destination of this washtub. I told them that I was on my way home. But they required me to come along to the police station. At the station, a uniformed policeman took charge of the washtub. I was shuttled into a cell with a bunk bed. I had to remove my belt and my shoelaces. While I was sitting in the cell, I had made up my mind concerning any future detention. I would try to escape at the first chance should they accused me of some illegal activity. About an hour passed. Then a uniformed policeman asked me to follow him. He took me to an office on the second floor. One of the two detectives that had stopped me on the street, asked me to sit down. He asked me if I had smuggled precious metal across the border before. I told him that I never smuggled anything across the border and that I bought the tub for a friend and the planned usage was as a washtub, not as precious metal. Besides, I did not even know that an ordinary washtub was precious metal. He said that this offense carried a two-year prison sentence. Then I casually mentioned that the tub had a slight hole and that I had planned to fix that hole. He got on the telephone and requested to have the tub brought to his office. When a policeman entered the room with the tub, the detective lifted the tub against the sunlight. He found the slight hole I had told him about. That little hole saved my neck. He gave me his card and directed the policeman to give me back to my personal property, including the tub. He explained to me that he was convinced that I did not smuggle precious metal. He said, "Should you be stopped before you get the border, show them my card, and ask them to call me." With the greatest relief, I marched out of the station and without hesitation took the shortest route to the border. I told myself at this point that I would never again enter East Berlin, or East Germany. College finals approached and I was getting very nervous. Tests never were my strength. As in high school, math and physics were still my favorites, but now also drawing, lab and shop had great appeal. I was weak in chemistry and thermo-dynamics. We had written tests and a 30-minute verbal test, conducted by three scholars. I told myself, "I kept my head with the Russians at the border, what can three scholars do to me?" It did not help. Standing in front of three wise man, little ol’ me, not only had to listen, but had to give some kind of intelligent answer. I cannot remember what the questions were, but apparently, they considered my answers satisfactory. "Satisfactory" was always the general grade I received, not good, not outstanding, just satisfactory. Our graduation ceremony was very spartan. Our principal came into our classroom, called names and handed the diploma to each person with a handshake. Someone had called a photographer. 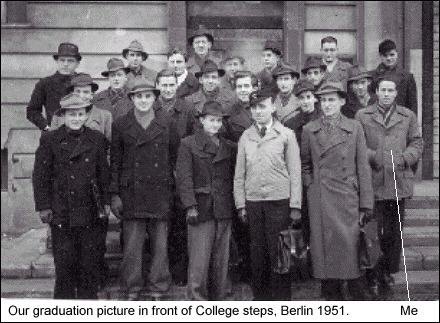 He took a picture of all the new engineers standing in a group on the college steps. We all shook hands and that was the last time I saw any of my classmates. Berlin in 1951 was just getting over the shock of the Russian blockade. Supplies were still scarce and so was money. However, we received the education free and all graduates had already lined up work with companies in Berlin. I had an offer to work at AEG, a large electric generator manufacturing company. I had about a week before starting work. My friend Hilde gave me a graduation presents, a white coat. Every engineer in Germany wore a white coat in the office. My parents were overjoyed and mother planned a celebration for the weekend. She had invited about 14 people, friends and relatives. I started my first real job, for real earned money, and wearing a white coat. How much better could it be? When I reported to the company, I met my manager. That was the only time I ever saw him in all my time with the company. Following that welcome, he introduced me to my supervisor, who welcomed me and took me into a large room with two rows of about 20 drawing boards. My supervisor marched me down the drawing board isle to introduce me to my group leader. The group leader took me two boards down to introduce me to my lead engineer. My lead engineer introduced himself as Mr. Kramer. Then he showed me my board and my cubicle. Welcome to German engineering. My lead engineer was really a very pleasant person. He helped me along and was very patient when I was a little dense. My first job was to calculate the natural frequency of a large electrical generator rotor, not by calculations, but by graphs on the board. My lead engineer mentioned that we had to have an answer in about four months. When I found a short-cut method, my lead looked and listened, and thought it to be a good idea. He went to the group leader and my lead explained the short-cut to the group leader. The group leader then went to the supervisor. He in turn went to the manager. My lead engineer then told me to develop it and prove what had now become the manager's short-cut idea. My workplace was located in the district of Moabit, while I lived in the Wittenau district. It took about half an hour to get there by bicycle. However, when I arrived at work, I always perspired from the ride, causing a problem. I then changed to public transportation, a bus. My first paycheck naturally was a special occasion. I gave my parents half of my paycheck for room and board. They did not encourage me to find my own place. Besides, it was not easy to find a place to live. We, my parents and I, got along just fine, and we had no reason to change. My mother did not necessarily want her only son to fly the coop, with her daughter living in Cologne. I still went dancing, mostly joined by my cousin Rudy. The American music was quite prevalent. I learned a few songs, phonetically. I did not know what they meant, but that was not important. Rudy and I got along splendidly and during our dancing excursions, we mostly looked for two ladies sitting together. Then we would agree on whom to select. It was a carefree time. My friend Hilde and I went to the movies often, usually once a week. Every movie we saw was an American movie with German speaking actors. You have probably not heard John Wayne or Alan Ladd speak German. I believe I saw "The Treasure of Sierra Madre" with Humphrey Bogart at least three times. James Stuart in "Destry Rides Again," and tearjerkers like "It's a Wonderful Life," were movies we had to see. I realized the movies depicted make-believe, and that real life in the USA might just be a little different; especially when I saw how businesses gave their white-collar workers room to be creative. They called their bosses by their first names. I did not even called my lead engineer by his first name. One evening, on our way home from the movies, I mentioned to Hilde that I would love to go to America. I had no idea how that little statement would change my life. Unbeknownst to me, Hilde wrote to an aunt of hers, who lived in Brooklyn, New York. Hilde told that aunt about me, apparently in glowing terms. The aunt, Marie was her name, wrote back and told Hilde she would be glad to sponsor me for immigration. When Hilde sprang the news, I had a frank talk with my parents. At first, they were not too crazy about the plan. After they had a few days to sleep on it, they acknowledged that I would eventually leave home anyway. The question was only, why so far away? I knew I would not stay in Berlin very long, and would at least find work in West Germany. Berlin had no future for me. The more I thought about it, the more I got enthusiastic about the idea of emigrating to the US of A.
I talked to the American embassy in Berlin and received forms to fill out. I mailed some of the forms to Aunt Marie. After the paperwork was completed, it was a waiting game. One thing I wanted to do; learn how to drive a car, instead of first learning the English language. In the movies, they showed that everybody had a car, so I expected that I would be able to buy a car. In Germany, it was a requirement that driving lessons were given only by a licensed school. I enrolled, and in two weeks, I had my permit. In the meantime, my parents made plans to move to West Germany. They were looking for a place in a small town, not far from Cologne, wanting to be close to their daughter and grandchildren. In October 1953, I received a visa to enter the USA and to become an immigrant. I had heard that after 5 years of living in the USA, I could apply for citizenship. Until then, the sponsor would be responsible for my not becoming a burden to the state. I gave notice to my employer, stating that as of December 10, 1953, I was leaving the firm. I booked passage on the SS Olympia, a 23,000-ton luxury Italian liner. It was to leave Bremerhaven, a West German port, on Dec. 12, 1953 and arrive in New York City on Dec. 18, 1953. To get to Bremerhaven I had two choices. Go by train and travel through East Germany, or fly to Bremen and take the train from Bremen to Bremerhaven. I had already sworn never to set foot back in the Eastern Zone. I scheduled my flight to Bremen. I took along enough German marks to convert to $100. I purchased a new suitcase, packed and unpacked a number of times. Come the day of my departure, I hugged my parents as I left their apartment. Hilde accompanied me to the airport. I had the address of Aunt Marie and her last name. I said goodbye to Hilde and she wished me God’s speed.